Vilasini Natyam By Swapna Sundari is an event that took place on 05-Nov-2007 in Hyderabad. Today, Swapnasundari will be presenting the Vilasini Natyam dance recital for the first recital of the day. Swapnasundari was trained in Kuchipudi under renowned masters Pasumarthi Seetharamaiah and Vempati Chinna Satyam. 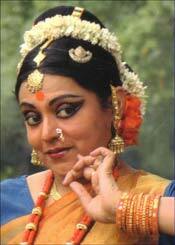 Her gurus in Bharatanatyam include K N Dakshinamurthy, Adyar K Lakshmanan and B Kalyana Sundaram. She received specialized training in abhinaya from the veteran performer and teacher Kalanidhi Narayanan, who is recognized for her mastery over the histrionic aspect, or the characteristic stylized mime, of Indian classical dance. Apart from her sound knowledge of Carnatic music, Swapnasundari has also specialized in the art of singing padams with Shrimati Mukta. This training enables her to lend a distinct character to her rendering through dance of traditional padams. Swapna's painstaking research into the temple dance traditions indigenous to the region of Andhra Pradesh has resulted in the unearthing and reconstruction of a nearly defunct dance genre, Vilasini Natyam. She had received guidance in this art from Maddula Lakshminarayana. As the founder-director of the Kuchipudi Dance Centre in New Delhi, she has trained a number of students and produced several ballets. The Delhi Government's Sahitya Kala Parishad Award and the prestigious Sangeet Natak Akademi Award from the Government of India are among the many honors that have been conferred upon Swapnasundari for her contribution to the arts. She is perhaps the youngest dancer who was presented with the national title of Padma Bhushan in recognition of her research into ancient dance forms and in the revival of the long lost dance art form, Vilasini Natyam. Be the first to comment on Vilasini Natyam By Swapna Sundari! Just use the simple form below. fullhyd.com has 700,000+ monthly visits. Tell Hyderabad what you feel about Vilasini Natyam By Swapna Sundari!